First, is anyone having any trouble that may be using AOL for their homepage? I'm suddenly experiencing loading problems with it, particularly on Firefox, but to a lesser degree on Internet Explorer. Also, what do you experts say about the '12 Touring that just showed up on Tbay? I tried to copy and paste the URL for that link but couldn't. For some reason on I.E. it wouldn't let me. Not having a good computer day!! 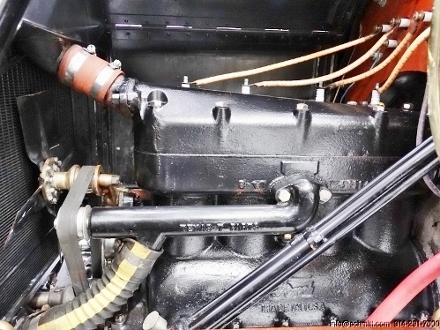 For sure the engine appears to be 1914, so that's pretty good. But the rest is not up to that price. And the floorboard trim around the clutch lever looks amateur. Plugs, H2O pump, and nickel head bolts aren't really there, ?? Am I dreaming of a 40K brass T? Uh...throw that lever forward, cut that floor mat! OK Good to go. 1912 Ford Model T GORGEOUS OLDER RESTORATION! 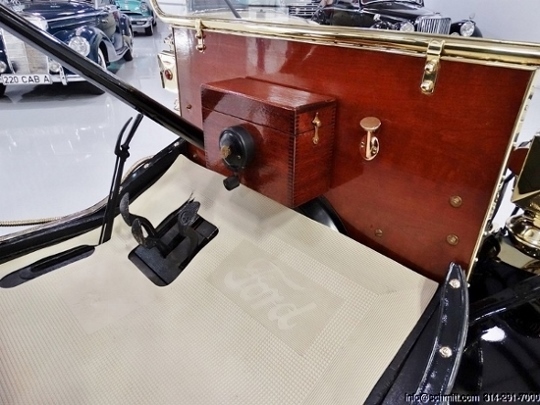 1912 FORD MODEL T TOURING, BRASS ACCESSORIES! SIDE STEP MOUNTED TOOL BOX! Thanks n maver for the link! And I just figured out what seemed to be wrong with my browser, I suddenly suspected it was this Ad-Aware antivirus program I loaded in. Took it out, and so far, so good! Dan, that was my thought exactly, in fact I even e-mailed the dealer about that myself! Told 'em this car was no way worth a "Grade 1" price. Looks good from a distance though. But my '15 has it beat hands down, both topside and underneath! Besides what everyone else has mentioned: High head, nuts/bolts on fan blades, who painted the brass windshield supports? The fit of the top is atrocious. If you drove it like that the wind would whip it to pieces. Also, for what is overall such a nice looking '12, black tread tires just look so wrong. White smoothies definitely worth it. And the lever/floormat?!? C'mon man. The NH carb I can live with. But, that should really be the only deviation for an otherwise beautiful, over-restored car. I would want to fork over the dough for a Stan Howe 5 ball though. It tries so hard but just absolutely whiffs and misses. Depending on who supposedly did the drivetrain I could see 20-25K. But it'd all have to come apart to check, gotta fix all of that little stupid stuff, and even then with '14 motor Idk if it's really worth 30K. Serious question: did '12s ever have that script radiator? I like those headlights though! Mmph, wouldn't mind a set of them babies for my brass speedster. The 5 year / 100,000 additional Miles Powertrain Warranty they offer is very appealing! 1912 should be blue, not black. 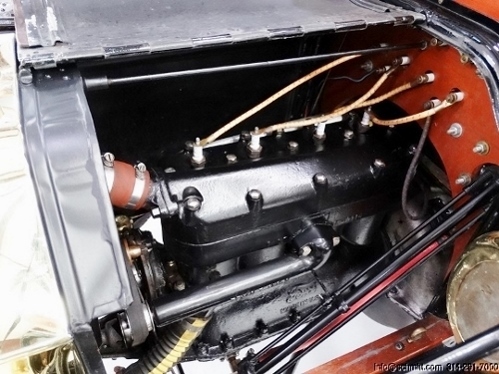 The wrong stuff we can see (water pump, wishbone, baggy top, etc.) leads me to suspect there's probably a lot more wrong stuff we can't see. Block has a 1914 casting date, doesn't it? The rad head lamp and side lamps are repro for that much money I would want the real brass and every 12 had a speedo. It sounds like a put together car? The serial number shown in the ad is ether a miss type or assigned number. Even if your remove the AIO the number is too low for 1912. I thing an assembled car might be on target. Looks like it could be missing it's front doors too.